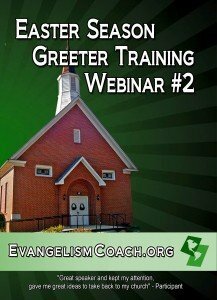 In January 2013, I recorded a new online class for Greeter Training, now available for sale in the store. Read below to get your copy of this Church Greeter Training DVD. Several of our readers participated in this webinar and have gotten their copy for use in their church. If you are not familiar with a webinar format, a webinar is an online class that shows a presentation while I narrate. This church greeter training product is a recording of that class. You can get a streaming download, or you can purchase a physical DVD (US ONLY). Several hundred copies of Greeter Training Webinar #1 have sold in the last two years. This new class builds on it. Thank you very much….helpful re: small talk and reminder of boundaries,etc. This webinar is now bundled in a two disc set or to download the pair. The blue order button will take you to the appropriate page at the EvangelismCoach.org store where you can order your 2 disc set or download only versions. If you purchase the download version, it’ll come as an MP4 file that you can transfer and play on other computers as you need. As with all my DVDs, this one comes with a generous refund policy – If you don’t like it, I’ll refund it.